Free hot breakfast free internet and free parking put cash back in the pockets of our guests at Country Inn and Suites by Carlson Beckley. For an additional fee you and a four-legged friend can pad over to this three-story hotel with 156 rooms. our guests sink into slumber on plush pillowtop mattresses. You can Google up a game plan with free internet. Hold on to that doggie bag for later with an in-room microwave and refrigerator. Rooms also have coffeemakers hairdryers and free newspapers. Hungry guests sink their teeth into yummy scrambled eggs savory sausage and hot waffles at the free breakfast. You can crunch your abs in the fitness center or crunch some numbers in the business center. 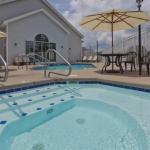 Splash in the heated indoor/outdoor pool or soak in the soothing hot tub. Local calls and parking are free. Country Inn and Suites is a half-mile from I-77 making highway access a breeze. You can swing drive or putt at Briar Patch Golf Course one-and-a-half miles away. Pick up some local wares at Tamarack a large arts and crafts complex less than one mile from the hotel. Adventure lovers hike the trails and go whitewater rafting at New River Gorge National River a 25-minute drive. The hotel is 13 miles from Raleigh County Memorial Airport.